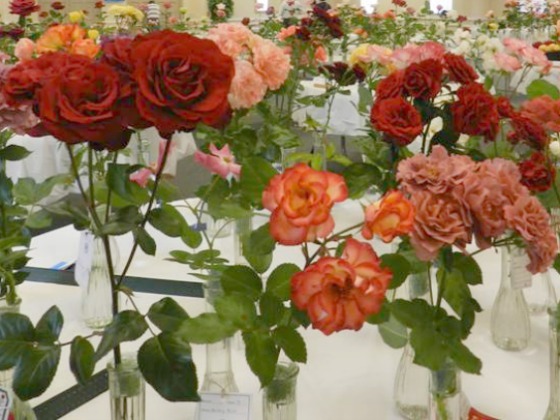 The South Metro Rose Society sponsors a rose show in May. The South Metro Rose Society will meet Aug.27 at 6:30 p.m. at The Heritage Bank at 440 N. Jeff Davis Drive in Fayetteville. All are invited to attend free of charge. Coming to us from Birmingham, Ala., Consulting Rosarian Chris Van Cleave is known as “The Redneck Rosarian” and is a humorous, down-to-earth speaker. His program will be a fun and interactive presentation that will break down common myths about growing roses and will demonstrate hands-on how to select the best rose varieties and companion plants to achieve maximum results in your garden. He will also share with you his best tips for planting and caring for your roses. Chris VanCleave is an active member of the American Rose Society, serving on its Marketing and Membership committee, as well as being the DSD Membership Chair since 2015. He is the editor of the popular ARS e-membership newsletter, “The Fragrant Rose.” In 2009, he created the Rose Chat Podcast, which has reached nearly a million listeners. He was a contributor to the 2015 Southern Living Gardening Book, has appeared on P. Allen Smith’s Garden Home television show and was featured in the June 2015 issue of Southern Living magazine. Chris serves as chairman of the Helena Alabama Beautification Board and last year helped launch the nation’s first municipal Earth Kind Rose Trial.